Christie’s, the auction house in New York, is poised to sell an artifact called “An Assyrian Gypsum Relief of a Winged Genius” from the famed Iraqi archaeological site of Nimrud. A Christie’s spokesperson conservatively estimated the artifact would sell for at least $10 million. An expert in the art of the ancient Middle East who preferred not to be named because of the amounts involved in this sale, stated he wouldn’t be surprised if the auction topped $20 million, which would exceed the current record for an Assyrian relief sold by Christie’s London in 1994. The relief arrived in the US in 1859 as a gift from an American missionary Dr. Henri Haskell to his friend, a professor at the Virginia Theological Seminary. At the time, such depictions were thought to have biblical significance and to inspire young seminarians in their missionary work. The sale, eagerly anticipated by some, is being criticized by a group of Iraqi scholars and activists who value the relief as an irreplaceable part of Iraq’s cultural history. The looting of Iraq’s cultural history increased dramatically with the US-led war in Iraq starting in 2003, and rose to unprecedented levels recently in areas under the control of ISIS. 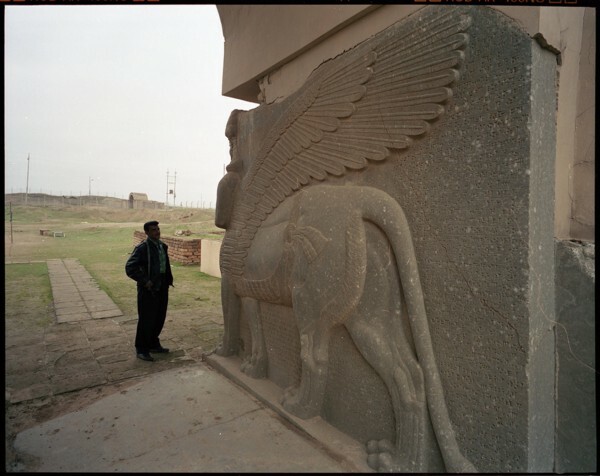 “ISIS is destroying Iraq’s heritage, and Christie’s is selling Iraq’s heritage,” says Abdulamir Hamdani, an Iraqi archaeologist who helped lead efforts to help protect archaeological sites from looting following the 2003 US-led invasion of Iraq. Mr. Hamdani is currently working in the Department of Archaeology at Durham University in the UK and helping train Iraqi archaeologists. 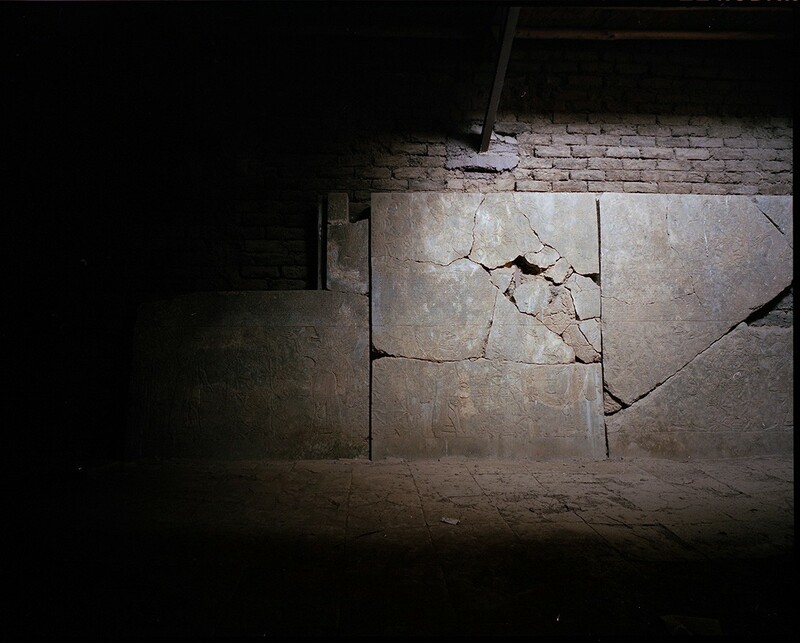 Mr. Hamdani’s concern is not only with the auctioning off of Iraqi history, but that the selling of Iraqi antiquities for high prices in the art market could create a demand for objects that would increase looting from archaeological sites. Patty Gerstenblith, a law professor at DePaul University who focuses on cultural heritage law, shares his concern. “Sometimes when there are highly publicized high-end sales, it might encourage more looting, it’s possible,” she says. However, she believes the focus should not be stopping the sale of objects legally excavated before the UNESCO convention of1970, but rather on increasing efforts to prevent looting today. 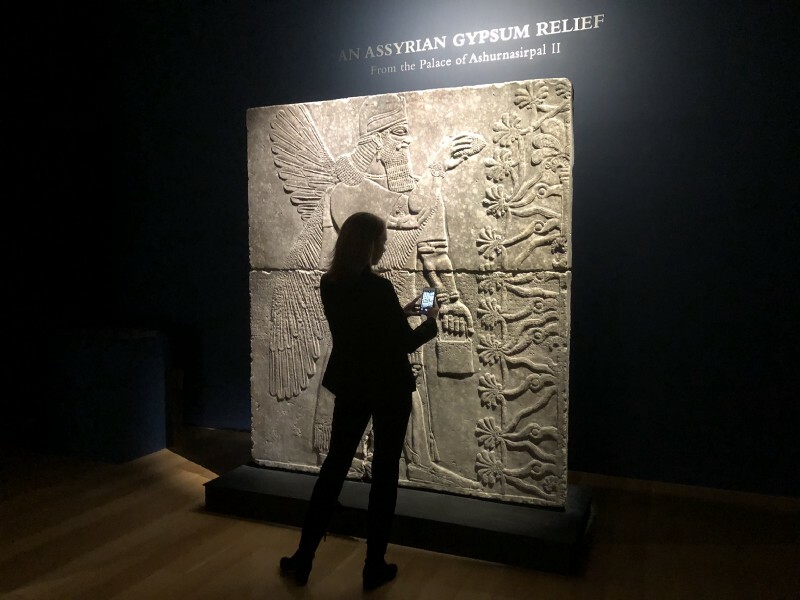 The Assyrian relief for sale by Christie’s falls within the “long-standing and legitimate market for works of art from the ancient world” and the excavation had the permission of the Grand Vizier of the Ottoman Sultan, according to a statement by a Christie’s spokesperson. The Virginia Theological Seminary declined to respond when asked about the ethical implications of auctioning off this piece of Iraq’s history, saying simply that all questions should be directed to Christie’s. The seminary has stated in a press release that they could no longer afford the insurance on the relief and that proceeds from the auction will go towards a scholarship fund. Whether the Iraqi government can or has made efforts to purchase the relief is unclear. An Iraqi deputy minister in the Ministry of Culture wrote a letter asking that the legal office of the Iraqi Ministry of Foreign Affairs stop the sale, and that the item be returned to Iraq. To date there has been no official response, nor has Mr. Jafaar received any response to his inquiries or petitions from the Iraqi government. Mr. Jafaar is not hopeful that the government can act in time. The new government in Iraq has not yet formed, and Mr. Jafaar would like for the sale to be delayed to give time for the Iraqi government to form and to be able to respond to the sale. Whether the Iraqi government can act after a sale is unclear and highly unlikely. 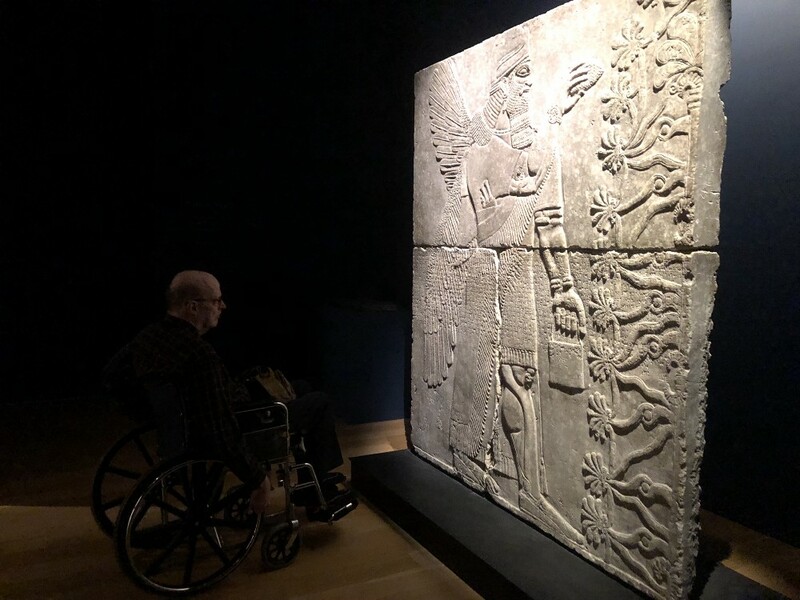 The fate of the Assyrian relief from Nimrud, now an echo from a once glorious ancient palace, will be decided when the gavel comes down on Wednesday. If it enters a private collection, there are, as Alice Stevenson, an Associate Professor in Museum Studies at UCL in London has pointed out, no legal protections for cultural property in private ownership. Even if this Nimrud relief ends up in a museum, the ethical questions raised by this sale remain. 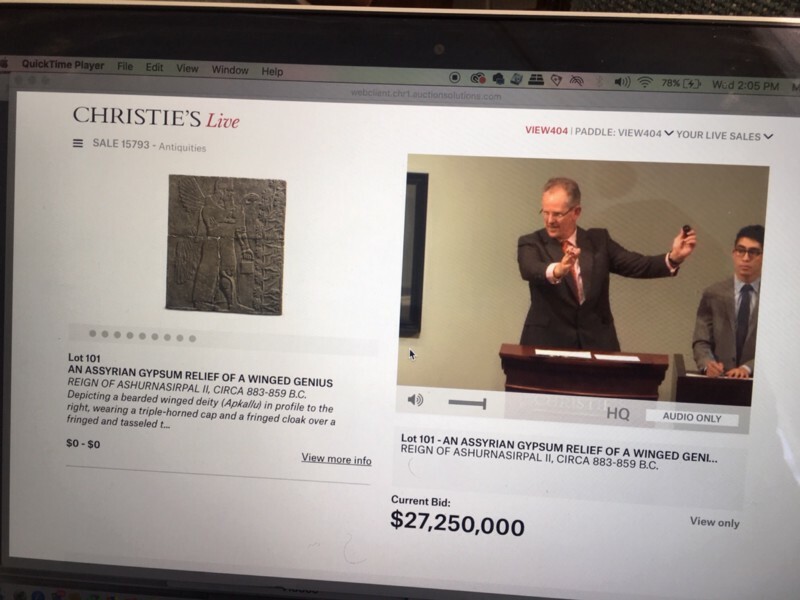 UPDATE: On Wednesday, October 31, 2018, the Assyrian relief was auctioned off for $27,250,000. Christie’s would not reveal the identity of the purchaser. 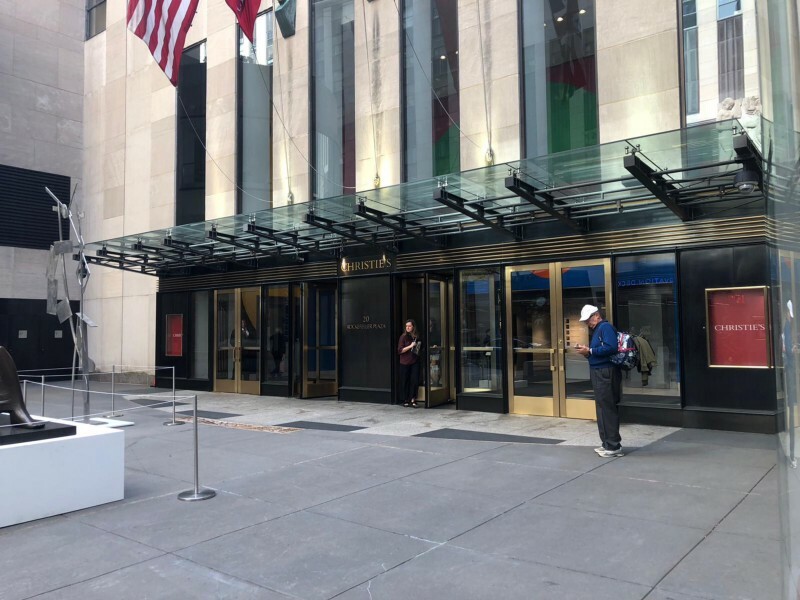 Man who had the winning bid stands outside Christie’s. He refused to give his name, or say who the buyer was.